Our weekend package includes overnight stabling for each day before you ride. Day riders are assigned a courtesy stall that can be used while you are on the grounds for the day. Overnight stabling can be purchased separately as needed. Your stall assignment will be posted on the office porch. Tack stalls are not guaranteed, but we try to slot them in as a courtesy. 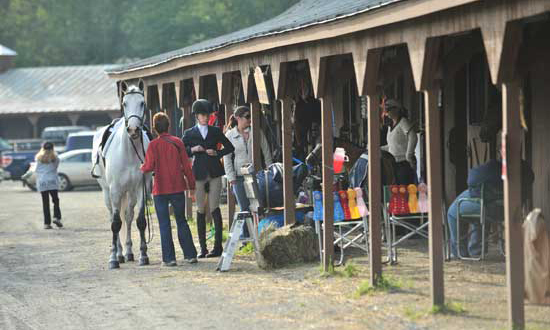 If you want to be guaranteed a tack stall, please purchase one when you register. Please see the entry form for details. Shavings and hay are available for purchase, or you may bring your own. It is your choice whether or not to use bedding in a day stall. Stalls must be stripped before you leave. Dirty stalls will be charged a $50 fine. There is no turnout at GMHA. Hand walking and grazing are permitted and encouraged. Due to Town Ordinances, camping on the grounds is not permitted on Memorial Day Pleasure Ride Weekend. The GMHA Ranch House has 2 large apartments for rent with full kitchens. To check on rental availability, go here. Offsite accommodations are plentiful, from camping to hotels and bed/breakfasts. See our website for details or call us for a recommendation.